Have you ever woken and seen that you weren't there. I mean you look in the mirror and your aren't there. Like you're invisible. Yeah you say it can't happen, but it can. It happened to Bobby Phillips. Meet Bobby Phillips, a fifteen year old kid living in Chicago , IL. He has a dad who can only talk in theories for everything and his mom is a literature freak. But then came a situation who really can not fix. It all started after the shower. He woke up and wiped the fog off the mirror and he wasn't there. He kept looking and he realized that it was what wasn't what he saw in the mirror. He wasn't there. One accidental mistake and Bobby's whole life was turned upside down. His parents couldn't believe it. They let him stay home from school that first day and that's when he meets Alicia. Alicia is blind. She has a keen sense of smell, taste, and touch and soon enough, Bobby and Alicia become friends. When Alicia realizes that he is invisible, Alicia wants to help him. Soon enough, the police are involved. How far will Bobby and Bobby's friends and family go to solve this problem? At first when you read this it sounds really stupid, but in the end this book is actually about friendships and how even though people are totally different, you can still have a friendship and I think that that is what counts in the end. 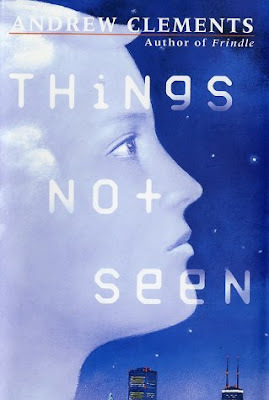 So if you ever get a chance try Things Not Seen, by Andrew Clements. You may never know it might just change your perspective of things.